Unisex Cotton toe socks with Silver fiber for diabetic and sensitive feet. No compression and seamless construction. Silver, thanks to its natural properties, provide an antibacterial and thermoregulation action maintaining the foot is protected and is in a healthy environment. The construction with individual toe sleeves, keeps the area clean and healthy. Available in 2 different lengths. 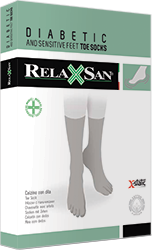 Unisex Cotton socks with Silver fiber, without compression and seamless, antibacterial and thermoregulating action. Unisex Cotton socks with Crabyon fiber, thanks to the natural properties of Chitin, provides protection and a regenerating action. Unisex Cotton toe socks with Silver fiber. The construction with individual toe sleeves, keeps the area clean and healthy.